When setting up a business, the first major accounting decision that must be made is whether to keep the books using the cash-basis accounting method or the accrual accounting method. Basically, if you decide to use the cash-basis accounting method, you record all transactions only when cash actually changes hands. Cash can include payment by cash, check credit card, electronic transfer, or any other means you pay for something you buy. If you decide to use the accrual accounting method, you record a transaction when the transaction is completed, even if cash has not yet changed hands. If you are using the cash-basis accounting method, you would not record the purchase in your books until you actually pay for the products with cash. If you are using the accrual accounting method, you would record the purchase immediately. You would record the purchase in an account called Purchases and you would record the liability to the vendor in an account called Accounts Payable on the day you get the bill for the goods, which allows you to track all pending obligations to vendors. Many small businesses run by a sole proprietor (single owner) or partnership group choose to use cash-basis accounting at first because it is easier, but as the business grows and there are many more transactions to keep track of a business usually will switch to the accrual method of accounting. 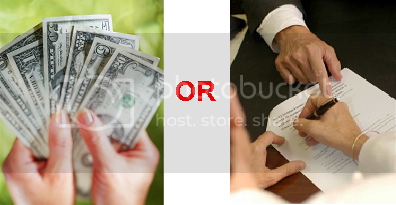 So Which Accounting Method Is Better; Cash Or Accrual Method? The cash-basis accounting method does a good job of tracking the flow of cash, but it does a poor job of matching your revenues to your expenses. The accrual accounting method does a good job of matching revenues and expenses, but does a poor job of tracking the use of cash. Companies that use accrual accounting also set up a system to monitor cash flow. The biggest difference between these two methods shows up with transactions that occur at the end of one year and the beginning of the next year. As you work through these problems you will see how differently the transactions are handled at the end of a year for each accounting method and how the way they are handled can impact the profits and expenses you show on your financial statements, as well as the taxes you may have to pay on any profits at the end of the year. There is a big difference between cash and accrual accounting. While cash accounting is easier, it does make it more difficult to keep track of money due from customers who buy on store credit, as well as payments due to vendors, suppliers, contractors, and others for purchases and other expenses. Your business carries over inventory month-to-month and year-to-year. It is more difficult to match costs for the inventory with the profits made from the sale of that inventory using the cash-basis method. Your business allows customers to buy on store credit. Your books will not show the revenue until the customers pay in cash. Also, you will have a more difficult time tracking how much is due from customers. You decide to incorporate your business. You have gross annual sales of more than $5 million. If you do start keeping your books using the cash-basis accounting method, you can convert to the accrual accounting method, but you may need to file a form with your local tax office called “The Change in Accounting Method”. Suppose we are keeping the books for a plumbing contractor who contracted to do a job on December 10 for $15,000 and received 50 percent up front or $7,500. He spent $5,000 in cash on materials December 17 and paid his workers $5,000 in cash on December 31 when the work was completed. The contractor did not meet with the customer for final approval of the work and final payment until January 10. How would we record these transactions using the cash-basis accounting method and how would we record them using the accrual accounting method? If we were keeping the books using the cash-basis method, we would record the cash received on December 10 of $7,500. We would record the $5,000 cash spent on materials on December 17 and we would record the payment to workers of $5,000 cash on December 31. When we closed our books for the year on December 31, this job would show revenues of $7,500 and expenses of $10,000 or a loss of $2,500. We would then record the $7,500 cash received on January 10 and have no corresponding expenses, so at the end of that year we would have an additional $7,500 in profits for work performed for the previous year with the expenses for the work recorded in the previous year. If we were using the accrual accounting method, we would record the receipt of $7,500 revenue on December 10; we would record the $5,000 cash spent on materials on December 17. We would record the payment to our workers of $5,000 in revenue on December 31. We would also record the final payment of $7,500 due in an account called Accounts Receivables, which tracks customer payments due. When we close our books at the end of the year, we would show a $5,000 profit on this job. We buy products for sale on June 16 on credit with the vendor and get a bill with the purchase. We don’t have to pay that bill until July 10. How would we record this transaction in our books if we are using cash-basis accounting and also how would we would record it using accrual accounting? For cash-basis accounting, we would not record anything in the books until we pay for the products with cash on July 10. For accrual accounting you would record the purchase on June 16 in Accounts Payable, as well as in the account where you record purchases.